As mainstream markets evolve, structured products that focus on volatility are becoming central to risk management and investment. Structured products focused on FX, emerging markets, rates and quantitative investment strategies (QIS) – were once seen as exotic; now these volatility-related products are becoming an increasingly mainstream tool for both risk management and investment. The explanation, according to Anthony Morris, Global Head of Quantitative Strategies, Fixed Income, is the gradual evolution of financial markets in recent decades. 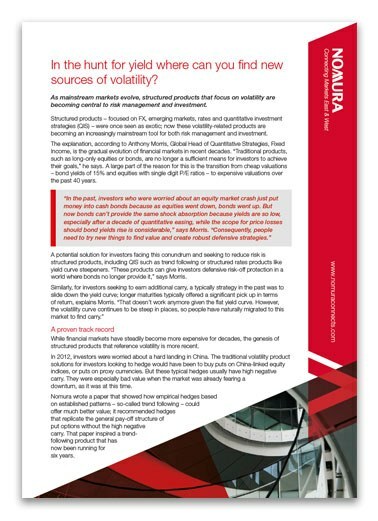 “Traditional products, such as long-only equities or bonds, are no longer a sufficient means for investors to achieve their goals,” says Anthony Morris, Global Head of Quantitative Strategies, Fixed Income, Nomura. "A large part of the reason for this is the transition from cheap valuations – bond yields of 15% and equities with single digit P/E ratios – to expensive valuations over the past 40 years." As well as responding to client approaches, banks involved in structured products bring relevant ideas to investors’ attention through education activities. In emerging markets, Nomura trades with local banks to source risk and distributes it to hedge funds or other investors that want exposure to EM rates, FX or inflation. Volatility products come about in a variety of ways. Clients may approach banks with specific product requests having identified a challenge and a solution through their own risk management processes. In other circumstances, banks proactively develop solutions where they see tactical opportunities in terms of market timing or strategic imperatives such as the impact of regulations. Nomura has been awarded Global Capital's Volatility Derivatives House of the Year 2018.